This article is about the capital of Australia. For other uses, see Canberra (disambiguation). Canberra (/ˈkænbərə/ ( listen)) is the capital city of Australia. With a population of 410,301, it is Australia's largest inland city and the eighth-largest city overall. The city is located at the northern end of the Australian Capital Territory, 280 km (170 mi) south-west of Sydney, and 660 km (410 mi) north-east of Melbourne. A resident of Canberra is known as a Canberran. 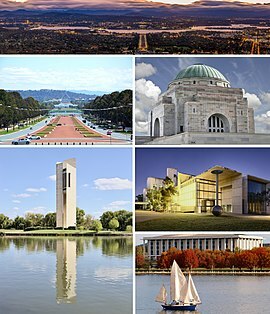 Although Canberra is the capital and seat of government, many federal government ministries have secondary seats in state capital cities, as do the Governor-General and the Prime Minister. The word "Canberra" is popularly claimed to derive from the word Kambera or Canberry, which is claimed to mean "meeting place" in Ngunnawal, one of the Indigenous languages spoken in the district by Aboriginal Australians before European settlers arrived, although there is no clear evidence to support this. An alternative definition has been claimed by numerous local commentators over the years, including the Ngunnawal elder Don Bell, whereby Canberra or Nganbra means "woman's breasts" and is the indigenous name for the two mountains, Black Mountain and Mount Ainslie, which lie almost opposite each other. In the 1860s, the name was reported by Queanbeyan newspaper owner John Gale to be an interpretation of the name nganbra or nganbira, meaning "hollow between a woman's breasts", and referring to the Sullivans Creek floodplain between Mount Ainslie and Black Mountain. An 1830s map of the region by Major Mitchell indeed does mark the Sullivan's Creek floodplain between these two mountains as "Nganbra". "Nganbra" or "Nganbira" could readily have been anglicised to the name "Canberry", as the locality soon become known to European settlers. R. H. Cambage in his 1919 book Notes on the Native Flora of New South Wales, Part X, the Federal Capital Territory noted that Joshua John Moore, the first settler in the region, named the area Canberry in 1823 stating that "there seems no doubt that the original was a native name, but its meaning is unknown."' Survey plans of the district dated 1837 refer to the area as the Canberry Plain. In 1920, some of the older residents of the district claimed that the name was derived from the Australian Cranberry which grew abundantly in the area, noting that the local name for the plant was canberry. Although popularly pronounced /ˈkænbərə/ or /kænˈbɛrə/, the original pronunciation at its official naming in 1913 was /ˈkænbrə/. Before white settlement, the area in which Canberra would eventually be constructed was seasonally inhabited by Indigenous Australians. Anthropologist Norman Tindale suggested the principal group occupying the region were the Ngunnawal people, while the Ngarigo lived immediately to the south of the ACT, the Wandandian to the east, the Walgulu also to the south, Gandangara people to the north and Wiradjuri to the north-west. Archaeological evidence of settlement in the region includes inhabited rock shelters, rock paintings and engravings, burial places, camps and quarry sites as well as stone tools and arrangements. Artefacts suggests early human activity occurred at some point in the area 21,000 years previously. European exploration and settlement started in the Canberra area as early as the 1820s. There were four expeditions between 1820 and 1824. White settlement of the area probably dates from 1823, when a homestead was built on what is now the Acton Peninsula by stockmen employed by Joshua John Moore. He formally applied to purchase the site on 16 December 1826 and named the property "Canberry". On 30 April 1827, Moore was told by letter that he could retain possession of 1,000 acres (405 ha) at Canberry. The European population in the Canberra area continued to grow slowly throughout the 19th century. Among them was the Campbell family of "Duntroon"; their imposing stone house is now the officers' mess of the Royal Military College, Duntroon. The Campbells sponsored settlement by other farmer families to work their land, such as the Southwells of "Weetangera". Other notable early settlers included the inter-related Murray and Gibbes families, who owned the Yarralumla estate —now the site of the official residence of the Governor-General of Australia — from the 1830s through to 1881. The oldest surviving public building in the inner-city is the Anglican Church of St John the Baptist, in the suburb of Reid, which was consecrated in 1845. St John's churchyard contains the earliest graves in the district. As the European presence increased, the indigenous population dwindled largely due to introduced diseases such as smallpox and measles. The district's change from a rural area in New South Wales to the national capital started during debates over federation in the late 19th century. Following a long dispute over whether Sydney or Melbourne should be the national capital, a compromise was reached: the new capital would be built in New South Wales, so long as it was at least 100 miles (160 km) from Sydney, with Melbourne to be the temporary seat of government while the new capital was built. A survey was conducted across several sites in New South Wales with Bombala, southern Monaro, Orange, Yass, Albury, Tamworth, Armidale,Tumut and Dalgety all discussed. Dalgety was chosen by the federal parliament and it passed the Seat of Government Act 1904 confirming Dalgety as the site of the nation's capital. However, the New South Wales government refused to cede the required territory as they did not accept the site. In 1906, the New South Wales Government finally agreed to cede sufficient land provided that it was in the Yass-Canberra region as this site was closer to Sydney. Newspaper proprietor John Gale circulated a pamphlet titled 'Dalgety or Canberra: Which?' advocating Canberra to every member of the Commonwealth's seven state and federal parliaments. By many accounts, it was decisive in the selection of Canberra as the site in 1908 as was a result of survey work done by the government surveyor Charles Scrivener. The NSW government ceded the district to the federal government in 1911 and the Federal Capital Territory was established. An international design competition was launched by the Department of Home Affairs on 30 April 1911, closing on 31 January 1912. The competition was boycotted by the Royal Institute of British Architects, the Institution of Civil Engineers and their affiliated bodies throughout the British Empire because the Minister for Home Affairs King O'Malley insisted that the final decision was for him to make rather than an expert in city planning. A total of 137 valid entries were received. O'Malley appointed a three-member board to advise him but they could not reach unanimity. On 24 May 1911, O'Malley came down on the side of the majority of the board with the design by Walter Burley Griffin and Marion Mahony Griffin of Chicago, Illinois, United States being declared the winner. Second was Eliel Saarinen of Finland and third was Alfred Agache of Brazil but resident in Paris, France. O'Malley then appointed a six-member board to advise him on the implementation of the winning design. On 25 November 1912, the board advised that it could not support Griffin's plan in its entirety and suggested an alternative plan of its own devising. This plan incorporated the best features of the three place-getting designs as well as of a fourth design by H. Caswell, R.C.G. Coulter and W. Scott-Griffiths of Sydney, the rights to which it had purchased. It was this composite plan that was endorsed by Parliament and given formal approval by O'Malley on 10 January 1913. In 1913, Griffin was appointed Federal Capital Director of Design and Construction and construction began. On 23 February, King O'Malley drove the first peg in the construction of the future capital city. In 1912, the government invited suggestions from the public as to the name of the future city. Almost 750 names were suggested. At midday on 12 March 1913, Lady Denman, the wife of Governor-General Lord Denman, announced that the city would be named "Canberra" at a ceremony at Kurrajong Hill, which has since become Capital Hill and the site of the present Parliament House. Canberra Day is a public holiday observed in the ACT on the second Monday in March to celebrate the founding of Canberra. After the ceremony, bureaucratic disputes hindered Griffin's work; a Royal Commission in 1916 ruled his authority had been usurped by certain officials and his original plan was reinstated. Griffin's relationship with the Australian authorities was strained and a lack of funding meant that by the time he was fired in 1920, little work had been done. By this time, Griffin had revised his plan, overseen the earthworks of major avenues and established the Glenloch Cork Plantation. The Commonwealth parliament moved to Canberra on 9 May 1927 with the opening of the Provisional Parliament House. The Prime Minister Stanley Bruce had officially taken up residence in The Lodge a few days earlier. Planned development of the city slowed significantly during the depression of the 1930s and during World War II. Some projects planned for that time, including Roman Catholic and Anglican cathedrals, were never completed. From 1920 to 1957, three bodies — successively the Federal Capital Advisory Committee, the Federal Capital Commission, and the National Capital Planning and Development Committee — continued to plan the further expansion of Canberra in the absence of Griffin. However, they were only advisory and development decisions were made without consulting them, which increased inefficiency. The largest event in Canberra up to World War II was the 24th Meeting of ANZAAS in January 1939. The Canberra Times described it as "a signal event ... in the history of this, the world's youngest capital city". The city's accommodation was not nearly sufficient to house the 1,250 delegates and a tent city had to be set up on the banks of the Molonglo River. One of the prominent speakers was H. G. Wells, who was a guest of the Governor-General Lord Gowrie for a week. This event coincided with a heatwave across south-eastern Australia during which the temperature in Canberra reached 108.5 degrees Fahrenheit (42.5 Celsius) on 11 January. On Friday, 13 January, the Black Friday bushfires caused 71 deaths in Victoria and Wells accompanied the Governor-General on his tour of areas threatened by fires. Immediately after the end of the war, Canberra was criticised for resembling a village and its disorganised collection of buildings was deemed ugly. Canberra was often derisively described as "several suburbs in search of a city". Prime Minister Sir Robert Menzies regarded the state of the national capital as an embarrassment. Over time his attitude changed from one of contempt to that of championing its development. He fired two ministers charged with the development of the city for poor performance. Menzies remained in office for over a decade and in that time the development of the capital sped up rapidly. The population grew by more than 50 per cent in every five-year period from 1955 to 1975. Several Government departments, together with public servants, were moved to Canberra from Melbourne following the war. Government housing projects were undertaken to accommodate the city's growing population. 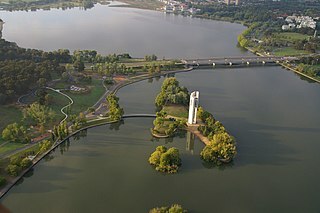 The National Capital Development Commission (NCDC) formed in 1957 with executive powers and ended four decades of disputes over the shape and design of Lake Burley Griffin — the centrepiece of Griffin's design — and construction was completed in 1964 after four years of work. The completion of the lake finally laid the platform for the development of Griffin's Parliamentary Triangle. Since the initial construction of the lake, various buildings of national importance have been constructed on its shores. The newly built Australian National University was expanded and sculptures as well as monuments were built. A new National Library was constructed within the Parliamentary Triangle, followed by the High Court and the National Gallery. 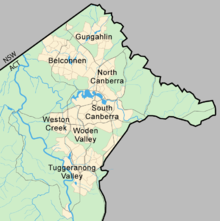 Suburbs in Canberra Central (often referred to as North Canberra and South Canberra) were further developed in the 1950s and urban development in the districts of Woden Valley and Belconnen commenced in the mid and late 1960s respectively. Many of the new suburbs were named after Australian politicians such as Barton, Deakin, Reid, Braddon, Curtin, Chifley and Parkes. On 9 May 1988, a larger and permanent Parliament House was opened on Capital Hill as part of Australia's bicentenary celebrations. The Commonwealth Parliament moved there from the Provisional Parliament House, now known as Old Parliament House. 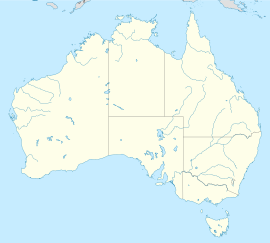 In December 1988, the Australian Capital Territory was granted full self-government by the Commonwealth Parliament. Following the first election on 4 March 1989, a 17-member Legislative Assembly sat at temporary offices at 1 Constitution Avenue, Civic, on 11 May 1989. Permanent premises were opened on London Circuit in 1994. The Australian Labor Party formed the ACT's first government, led by the Chief Minister Rosemary Follett, who made history as Australia's first female head of government. Parts of Canberra were engulfed by bushfires on 18 January 2003 that killed four people, injured 435 and destroyed more than 500 homes as well as the major research telescopes of Australian National University's Mount Stromlo Observatory. Throughout 2013, several events celebrated the 100th anniversary of the naming of Canberra. On 11 March 2014, the last day of the centennial year, the Canberra Centenary Column was unveiled in City Hill. Other works included The Skywhale, a hot air balloon designed by the sculptor Patricia Piccinini, and StellrScope by visual media artist Eleanor Gates-Stuart. Canberra covers an area of 814.2 square kilometres (314.4 sq mi) and is located near the Brindabella Ranges, approximately 150 kilometres (93 mi) inland from Australia's east coast. It has an elevation of approximately 580 metres (1,900 ft) AHD; the highest point is Mount Majura at 888 m (2,913 ft). Other low mountains include Mount Taylor 855 m (2,805 ft), Mount Ainslie 843 m (2,766 ft), Mount Mugga Mugga 812 m (2,664 ft) and Black Mountain 812 m (2,664 ft). Under Köppen-Geiger classification, Canberra has an oceanic climate (Cfb). In January, the warmest month, the average high is approximately 28 °C (82 °F); however, in July, the coldest month, the average high drops to approximately 11 °C (52 °F). Frost is common in the winter months. Snow is rare in the CBD (central business district), but the surrounding areas get annual snowfall through winter and often the snow-capped mountains can be seen from the CBD. The last significant snowfall in the city centre was in 1968. The highest recorded maximum temperature is variously reported as 42.2 °C (108.0 °F) on 1 February 1968, or as 42.8 °C (109.0 °F) at Acton on 11 January 1939. Winter 2011 was Canberra's warmest winter on record, approximately 2 °C (4 °F) above the average temperature. Canberra is being impacted by Global Warming indicated by a long-running tendency for temperatures to increase. The lowest recorded minimum temperature was −10.0 °C (14.0 °F) on the morning of 11 July 1971. Light snow falls only once or twice per year, and it is usually not widespread and quickly dissipates. Canberra is protected from the west by the Brindabellas which create a slight rain shadow in Canberra's valleys. Canberra gets 100.4 clear days annually. Annual rainfall is the third lowest of the capital cities (after Adelaide and Hobart) and is spread fairly evenly over the seasons, with late spring bringing the highest rainfall. Thunderstorms occur mostly between October and April, owing to the effect of summer and the mountains. The area is not very windy and the breeze is at its strongest from August to November. Canberra is less humid than the nearby coastal areas. Floriade is held in Commonwealth Park every spring. It is the largest flower festival in the Southern Hemisphere, employing and encouraging environmental practises, including the use of green energy. The average Canberran was responsible for 13.7 tonnes of greenhouse gases in 2005. In 2012, the ACT Government legislated greenhouse gas targets to reduce its emissions by 40 per cent from 1990 levels by 2020, 80 per cent by 2050, with no net emissions by 2060. The government announced in 2013 a target for 90% of electricity consumed in the ACT to be supplied from renewable sources by 2020, and in 2016 set an ambitious target of 100% by 2020. There is no local council or city government for the city of Canberra. The Australian Capital Territory Legislative Assembly performs the roles of both a city council for the city and a territory government for the rest of the Australian Capital Territory. However, the vast majority of the population of the Territory reside in Canberra and the city is therefore the primary focus of the ACT Government. The assembly consists of 25 members elected from five districts using proportional representation. The five districts are Brindabella, Ginninderra, Kurrajong, Murrumbidgee and Yerrabi, which each elect five members. The Chief Minister is elected by the Members of the Legislative Assembly (MLA) and selects colleagues to serve as ministers alongside him or her in the Executive, known informally as the cabinet. As of April 2019[update], the Chief Minister was Andrew Barr from the Australian Labor Party. Whereas the ACT has federally been dominated by Labor, the Liberals have been able to gain some footing in the ACT Legislative Assembly and were in government during a period of six and half years from 1995 and 2001. Labor took back control of the Assembly in 2001. At the 2004 election, Chief Minister Jon Stanhope and the Labor Party won 9 of the 17 seats allowing them to form the ACT's first majority government. Since 2008, the ACT has been governed by a coalition of Labor and the Greens. The Australian federal government retains some influence over the ACT government. In the administrative sphere, most frequently this is through the actions of the National Capital Authority which is responsible for planning and development in areas of Canberra which are considered to be of national importance or which are central to Griffin's plan for the city, such as the Parliamentary Triangle, Lake Burley Griffin, major approach and processional roads, areas where the Commonwealth retains ownership of the land or undeveloped hills and ridge-lines (which form part of the Canberra Nature Park). The national government also retains a level of control over the Territory Assembly through the provisions of the Australian Capital Territory (Self-Government) Act 1988. This federal act defines the legislative power of the ACT assembly. The ACT was given its first federal parliamentary representation in 1949 when it gained a seat in the House of Representatives, the Division of Australian Capital Territory. However, the ACT member could only vote on matters directly affecting the territory. In 1974, the ACT was allocated two Senate seats. In 1974, the House of Representatives seat was divided into two. A third was created in 1996, but was abolished in 1998 because of changes to the regional demographic distribution. At the 2019 election, the third seat has been reintroduced as the Division of Bean. Both House of Representatives seats have mostly been held by Labor and usually by comfortable margins. The Labor Party has polled at least seven percentage points more than the Liberal Party at every federal election since 1990 and their average lead since then has been 15 percentage points. The ALP and the Liberal Party have always held one Senate seat each. The Australian Federal Police (AFP) provides all of the constabulary services in the territory in a manner similar to state police forces, under a contractual agreement with the ACT Government. The AFP does so through its community policing arm ACT Policing. People who have been charged with offences are tried either in the ACT Magistrates Court or, for more severe offences, the ACT Supreme Court. Prior to its closure in 2009, prisoners were held in remand at the Belconnen Remand Centre in the ACT but usually gaoled in New South Wales. The Alexander Maconochie Centre was officially opened on 11 September 2008 by then Chief Minister Jon Stanhope. The total cost for construction was $130 million. The ACT Civil and Administrative Tribunal deal with minor civil law actions and other various legal matters. Canberra has the lowest rate of crime of any capital city in Australia as of February 2019[update]. As of 2016[update] the most common crimes in the ACT were property related crimes, unlawful entry with intent and motor vehicle theft. They affected 2,304 and 966 people (580 and 243 per 100,000 persons respectively). Homicide and related offences—murder, attempted murder and manslaughter, but excluding driving causing death and conspiracy to murder—affect 1.0 per 100,000 persons, which is below the national average of 1.9 per 100,000. Rates of sexual assault (64.4 per 100,000 persons) are also below the national average (98.5 per 100,000). However the 2017 crime statistics showed a rise in some types of personal crime, notably burglaries, thefts and assaults. In May 2012, the unemployment rate in Canberra was 3.4% which was lower than the national unemployment rate of 5.1%. As a result of low unemployment and substantial levels of public sector and commercial employment, Canberra has the highest average level of disposable income of any Australian capital city. The gross average weekly wage in Canberra is $1702 compared with the national average of $1485.80 (May 2013). The median house price in Canberra as of September 2009 was $511,820, lower than only Sydney among capital cities of more than 100,000 people, having surpassed Melbourne and Perth since 2005. The median weekly rent paid by Canberra residents is higher than rents in all other states and territories. As of January 2014 the median unit rent in Canberra was $410 per week and median housing rent was $460, making the city the third most expensive in the country. Factors contributing to this higher weekly rental market include; higher average weekly incomes, restricted land supply, and inflationary clauses in the ACT Residential Tenancies Act. The city's main industry is public administration and safety, which accounted for 29.8% of Gross Territory Product in 2011–12 and employed 33.9% of Canberra's workforce. The headquarters of many Australian Public Service agencies are located in Canberra, and Canberra is also host to several Australian Defence Force establishments, most notably the Australian Defence Force headquarters and HMAS Harman, which is a naval communications centre that is being converted into a tri-service, multi-user depot. The former RAAF Fairbairn, adjacent to the Canberra Airport was sold to the operators of the airport, but the base continues to be used for RAAF VIP flights. A growing number of software vendors have based themselves in Canberra, to capitalise on the concentration of government customers; these include Tower Software and RuleBurst. A consortium of private and government investors is making plans for a billion-dollar data hub, with the aim of making Canberra a leading centre of such activity in the Asia-Pacific region. At the 2016 census, the population of Canberra was 395,790, up from 355,596 at the 2011 census and 322,036 at the 2006 census. Canberrans are relatively young, highly mobile and well educated. The median age is 35 years and only 12.7% of the population is aged over 65 years. Between 1996 and 2001, 61.9% of the population either moved to or from Canberra, which was the second highest mobility rate of any Australian capital city. As at May 2017, 43% of ACT residents (25–64) had a level of educational attainment equal to at least a bachelor's degree, significantly higher that the national average of 31%. According to statistics collected by the National Australia Bank and reported in The Canberra Times, Canberrans on average give significantly more money to charity than Australians in other states and territories, for both dollar giving and as a proportion of income. The 2016 census showed Aboriginal and Torres Strait Islander people made up 1.6% of Canberra's population, while 32.1% of the population were born overseas. The largest group of people born overseas came from the United Kingdom (3.2%) and then China (2.9%). Significant numbers of immigrants have also come from Germany, France, Belgium, Netherlands, Turkey, Greece, Italy, Vietnam, India, New Zealand and the Philippines. Most locals only speak English at home (72.7%); other languages spoken at home include Mandarin, Vietnamese, Cantonese, Hindi and Spanish. On census night in 2016, approximately 50.0% of ACT residents described themselves as Christian (excluding not stated responses), the most common denominations being Catholic and Anglican; 36.2% described themselves as having no religion. The two main tertiary institutions are the Australian National University (ANU) in Acton and the University of Canberra (UC) in Bruce, with over 10,500 and 8,000 full-time-equivalent students respectively. Established in 1946, the ANU has always had a strong research focus and is ranked among the leading universities in the world and the best in Australia by The Times Higher Education Supplement and the Shanghai Jiao Tong World University Rankings. There are two religious university campuses in Canberra: Signadou in the northern suburb of Watson is a campus of the Australian Catholic University; St Mark's Theological College in Barton is part of the secular Charles Sturt University. The Australian Defence Force Academy (ADFA) and the Royal Military College, Duntroon are located in the inner-northern suburb of Campbell. ADFA teaches military undergraduates and postgraduates and includes [email protected], a campus of the University of New South Wales; Duntroon provides Australian Army officer training. Tertiary level vocational education is also available through the multi-campus Canberra Institute of Technology. In 2016 there were 132 schools in Canberra; 87 were operated by the government and 45 were private. During 2006, the ACT Government announced closures of up to 39 schools, to take effect from the end of the school year, and after a series of consultations unveiled its Towards 2020: Renewing Our Schools policy. As a result, some schools closed during the 2006–08 period, while others were merged; the creation of combined primary and secondary government schools will proceed over the next decade. The new policy has provoked significant opposition. Most suburbs are planned to include a primary and a nearby preschool; these are usually located near open areas where recreational and sporting activities are easily available. Canberra also has the highest percentage of non-government (private) school students in Australia, accounting for 40.6 per cent of ACT enrollments. As Australia's capital, Canberra is the most important centre for much of Australia's political reportage and thus all the major media, including the Australian Broadcasting Corporation, the commercial television networks, and the metropolitan newspapers maintain local bureaus. News organisations are represented in the "press gallery", a group of journalists who report on the national parliament. The National Press Club of Australia in Barton has regular television broadcasts of its lunches at which a prominent guest, typically a politician or other public figure, delivers a speech followed by a question-and-answer session. Canberra has a daily newspaper, The Canberra Times, which was established in 1926. There are also several free weekly publications, including news magazines CityNews and Canberra Weekly as well as entertainment guide BMA Magazine. BMA Magazine first went to print in 1992; the inaugural edition featured coverage of the Nirvana Nevermind tour. There are a number of AM and FM stations broadcasting in Canberra (AM/FM Listing). The main commercial operators are the Capital Radio Network (2CA and 2CC), and Austereo/ARN (104.7 and Mix 106.3). There are also several community operated stations. Prior to 1989, Canberra was serviced by just the ABC, SBS and Capital Television (CTC), which later became Southern Cross Nine, with Prime Television (now Prime7) and WIN Television arriving as part of the Government's regional aggregation programme in that year. In addition to local sporting leagues, Canberra has a number of sporting teams that compete in national and international competitions. The best known teams are the Canberra Raiders and the Brumbies who play rugby league and rugby union respectively; both have been champions of their leagues. Both teams play their home games at Canberra Stadium, which is the city's largest stadium and was used to hold group matches in soccer for the 2000 Summer Olympics and in rugby union for the 2003 Rugby World Cup. The city also has a successful basketball team, the Canberra Capitals, which has won seven out of the last eleven national women's basketball titles. Canberra United FC represents the city in the W-League, the national women's association football league, and were champions in the 2011–12 season. The Canberra Vikings represent the city in the National Rugby Championship and finished second in the 2015 season. There are also teams that participate in national competitions in netball, field hockey, ice hockey, cricket and baseball. Manuka Oval is another large outdoor sporting facility where cricket and Australian Rules football are played. Expansion AFL club Greater Western Sydney Giants commenced a partnership with Canberra in 2012 under which it will play three home games at Manuka Oval each season until at least 2021. Prior to this the Melbourne-based AFL team the Kangaroos played some home games at Manuka Oval until July 2006. Following the move of the Kangaroos' alternative home ground to Carrara in Queensland, Melbourne and the Western Bulldogs played some home games at Manuka Oval from 2007 against the Sydney Swans. Canberra is also home to the Barassi International Australian Football Youth Tournament. The historic Prime Minister's XI cricket match is played at Manuka Oval annually. Other significant annual sporting events include the Canberra Marathon and the City of Canberra Half Ironman Triathlon. The Australian Institute of Sport (AIS) is located in the Canberra suburb of Bruce. The AIS is a specialised educational and training institution providing coaching for elite junior and senior athletes in a number of sports. The AIS has been operating since 1981 and has achieved significant success in producing elite athletes, both local and international. The majority of Australia's team members and medallists at the 2000 Summer Olympics in Sydney were AIS graduates. Canberra has numerous sporting ovals, golf courses, skate parks, and swimming pools that are open to the public. Tennis courts include those at the National Sports Club, Lyneham, former home of the Canberra Women's Tennis Classic. A Canberra-wide series of bicycle paths are available to cyclists for recreational and sporting purposes. Canberra Nature Parks have a large range of walking paths, horse and mountain bike trails. Water sports like sailing, rowing, dragon boating and water skiing are held on Canberra's lakes. The Rally of Canberra is an annual motor sport event and a facility for drag racing is being planned for construction. [needs update?] From 2000 to 2002, Canberra hosted the Canberra 400 event for V8 Supercars on the temporary Canberra Street Circuit, which was located inside the Parliamentary Triangle. Canberra has two large public hospitals, the approximately 600-bed Canberra Hospital—formerly the Woden Valley Hospital—in Garran and the 174-bed Calvary Public Hospital in Bruce. Both are teaching institutions. The largest private hospital is the Calvary John James Hospital in Deakin. Calvary Private Hospital in Bruce and Healthscope's National Capital Private Hospital in Garran are also major healthcare providers. 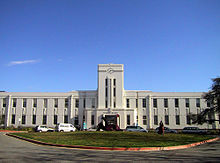 The Royal Canberra Hospital was located on Acton Peninsula on Lake Burley Griffin; it was closed in 1991 and was demolished in 1997 in a controversial and fatal implosion to facilitate construction of the National Museum of Australia. The city has 10 aged care facilities. Canberra's hospitals receive emergency cases from throughout southern New South Wales, and ACT Ambulance Service is one of four operational agencies of the ACT Emergency Services Authority. NETS provides a dedicated ambulance service for inter-hospital transport of sick newborns within the ACT and into surrounding New South Wales. The automobile is by far the dominant form of transport in Canberra. The city is laid out so that arterial roads connecting inhabited clusters run through undeveloped areas of open land or forest, which results in a low population density; this also means that idle land is available for the development of future transport corridors if necessary without the need to build tunnels or acquire developed residential land. In contrast, other capital cities in Australia have substantially less green space. In an effort to improve road safety, traffic cameras were first introduced to Canberra by the Carnell Government in 1999. The traffic cameras installed in Canberra include fixed red-light and speed cameras and point-to-point speed cameras; together they bring in revenue of approximately $11 million per year in fines. ACTION, the government-operated bus service, provides public transport throughout the city. Qcity Transit provides bus services between Canberra and nearby areas of New South Wales through their Transborder Express brand (Murrumbateman and Yass) and as Qcity Transit (Queanbeyan). A light rail line is under construction. It will be completed in April 2019 and will link the CBD with the northern district of Gungahlin. At the 2016 census, 7.1% of the journeys to work involved public transport, while 4.5% walked to work. There are two local taxi companies. Aerial Capital Group enjoyed monopoly status until the arrival of Cabxpress in 2007. In October 2015 the ACT Government passed legislation to regulate ride sharing, allowing ride share services including Uber to operate legally in Canberra. The ACT Government was the first jurisdiction in Australia to enact legislation to regulate the service. An interstate NSW TrainLink railway service connects Canberra to Sydney. Canberra's railway station is in the inner south suburb of Kingston. Between 1920 and 1922 the train line crossed the Molonglo River and ran as far north as the city centre, although the line was closed following major flooding and was never rebuilt, while plans for a line to Yass were abandoned. A 3 ft 6 in (1,067 mm) gauge construction railway was built in 1923 between the Yarralumla brickworks and the provisional Parliament House; it was later extended to Civic, but the whole line was closed in May 1927. Train services to Melbourne are provided by way of a NSW TrainLink bus service which connects with a rail service between Sydney and Melbourne in Yass, about a one-hour drive from Canberra. Plans to establish a high-speed rail service between Melbourne, Canberra and Sydney, have not been implemented, as the various proposals have been deemed economically unviable. The original plans for Canberra included proposals for railed transport within the city, however none eventuated. The phase 2 report of the most recent proposal, the High Speed Rail Study, was published by the Department of Infrastructure and Transport on 11 April 2013. A railway connecting Canberra to Jervis Bay was also planned but never constructed. Canberra Airport provides direct domestic services to Sydney, Melbourne, Brisbane, Adelaide, Gold Coast and Perth, with connections to other domestic centres. There are also direct flights to small regional towns: Dubbo and Newcastle in New South Wales. Regular commercial international flights operate to Singapore and Wellington from the airport four times a week. Canberra Airport is, as of September 2013, designated by the Australian Government Department of Infrastructure and Regional Development as a restricted use designated international airport. Until 2003 the civilian airport shared runways with RAAF Base Fairbairn. In June of that year, the Air Force base was decommissioned and from that time the airport was fully under civilian control. Canberra has one of the highest rates of active travel of all Australian major cities, with 7.1 per cent of commuters walking or cycling to work in 2011. An ACT Government survey conducted in late 2010 found that Canberrans walk an average of 26 minutes each day. According to The Canberra Times in March 2014, Canberra's cyclists are involved in an average of four reported collisions every week. The newspaper also reported that Canberra is home to 87,000 cyclists, translating to the highest cycling participation rate in Australia; and, with higher popularity, bike injury rates in 2012 were twice the national average. The government-owned ACTEW Corporation manages Canberra's water and sewerage infrastructure. ActewAGL is a joint venture between ACTEW and AGL, and is the retail provider of Canberra's utility services including water, natural gas, electricity, and also some telecommunications services via a subsidiary TransACT. There are no wind-power generators in Canberra, but several have been built or are being built or planned in nearby New South Wales, such as the 140.7 megawatt Capital Wind Farm. The ACT government announced in 2013 that it was raising the target for electricity consumed in the ACT to be supplied from renewable sources to 90% by 2020, raising the target from 210 to 550 megawatts. It announced in February 2015 that three wind farms in Victoria and South Australia would supply 200 megawatts of capacity; these are expected to be operational by 2017. Contracts for the purchase of an additional 200 megawatts of power per year from two wind farms in South Australia and New South Wales were announced in December 2015 and March 2016. The ACT government announced in 2014 that up to 23 megawatts of feed-in-tariff entitlements would be made available for the establishment of a facility in the ACT or surrounding region for burning household and business waste to produce electricity by 2020. Hangzhou, China: The ACT Government signed a Memorandum of Understanding with the Hangzhou Municipal People's Government on 29 October 1998. The Agreement was designed to promote business opportunities and cultural exchanges between the two cities. Dili, East Timor: The Canberra Dili Friendship Agreement was signed in 2004, aiming to build friendship and mutual respect and promote educational, cultural, economic, humanitarian and sporting links between Canberra and Dili. ^ a b "3218.0 – Regional Population Growth, Australia, 2015–16:ESTIMATED RESIDENT POPULATION – Australia's capital city populations, June 2017". Australian Bureau of Statistics. Australian Bureau of Statistics. Retrieved 25 November 2018. Estimated resident population, 30 June 2017. ^ "GFS / BOM data for CANBERRA AIRPORT". Retrieved 16 June 2018. ^ a b "Planning Data Statistics". ACT Planning & Land Authority. 21 July 2009. Archived from the original on 2 August 2008. Retrieved 13 May 2010. ^ Macquarie Dictionary (6 ed.). Sydney: Macquarie Dictionary Publishers. 2013. Entry "Canberra". ISBN 9781876429898. ^ "Place Names". The Australian Women's Weekly. 1932–1982: National Library of Australia. 13 May 1964. p. 61. Archived from the original on 27 March 2011. Retrieved 22 February 2011. ^ a b Frei, Patricia. "Discussion on the Meaning of 'Canberra'". Canberra History Web. Patricia Frei. Archived from the original on 27 September 2013. Retrieved 11 August 2013. ^ Hull, Crispin. "European settlement and the naming of Canberra". 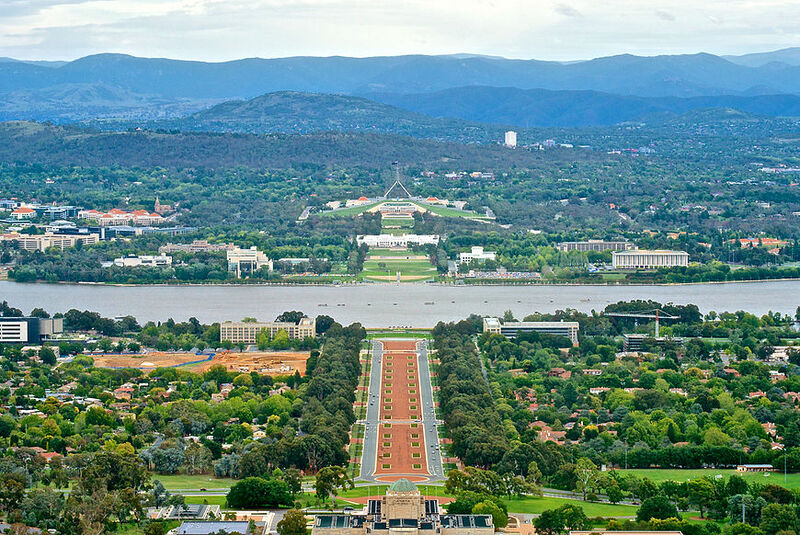 Canberra – Australia's National Capital. Crispin Hull. Retrieved 7 June 2010. ^ Cambage, Richard Hind; Linnean Society of New South Wales (1919). "Notes on the native flora of New South Wales. Part X, The Federal Capital Territory". Linnean Society of New South Wales. Retrieved 14 October 2013. ^ a b "Blundells Cottage". National Capital Authority. Archived from the original on 1 May 2013. Retrieved 13 May 2010. ^ a b Fitzgerald 1987, p. 5. ^ a b Gillespie 1991, pp. 3-8. ^ Gillespie 1991, p. 9. ^ "LETTERS". The Sydney Morning Herald. National Library of Australia. 31 January 1934. p. 6. Archived from the original on 28 July 2013. Retrieved 8 October 2012. ^ Gibbney 1988, p. 48. ^ Fitzgerald 1987, p. 9. ^ "The Royal Military College, Duntroon" (PDF). Defence Housing Australia. p. 81. Archived from the original (PDF) on 18 March 2012. Retrieved 13 May 2010. ^ Gibbney 1988, pp. 87-95. ^ "Government House". Governor General of Australia. Archived from the original on 19 July 2008. Retrieved 23 April 2010. ^ a b Sparke 1988, p. 116. ^ Gillespie 1991, p. 78. ^ Fitzgerald 1987, p. 17. ^ Weatherill, David (2007). "Church of St John the Baptist Cemetery". The Heraldry & Genealogy Society of Canberra. Archived from the original on 3 April 2013. Retrieved 7 May 2010. ^ a b "Canberra – Australia's capital city". Department of the Environment, Water, Heritage and the Arts. 4 February 2010. Archived from the original on 10 April 2011. Retrieved 23 April 2010. ^ a b c Fitzgerald 1987, p. 92. ^ Gillespie 1991, pp. 220-230. ^ Wigmore 1971, p. 24. ^ a b Fitzhardinge, L. F. (1975). Old Canberra and the search for a capital. Canberra & District Historical Society. p. 27. ISBN 0-909655-02-2. ^ Fitzgerald, Alan (1987). Canberra in two centuries: A pictorial history. Clareville Press. ISBN 0-909278-02-4. ^ Fitzgerald 1987, p. 93. ^ Fitzgerald 1987, p. 100. ^ Gillespie 1991, p. 178. ^ Wigmore 1971, pp. 160-166. ^ Wigmore 1971, p. 63. ^ Gillespie 1991, p. 303. ^ Fitzgerald 1987, p. 103. ^ Fitzgerald 1987, p. 105. ^ Wigmore 1971, pp. 70-71. ^ Fitzgerald 1987, p. 101. ^ a b National Capital Development Commission 1988, p. 4. ^ a b Wigmore 1971, pp. 69-79. ^ a b "History of the NCA". National Capital Authority. 11 June 2009. Archived from the original on 12 February 2014. Retrieved 26 February 2010. ^ Fitzgerald 1987, p. 130. ^ Museum of Australian Democracy at Old Parliament House (12 April 2010). "Witness to history: the opening of the Provisional Parliament House in 1927". Museum of Australian Democracy at Old Parliament House. Archived from the original on 13 May 2013. ^ "Ethel Bruce – Stanley Melbourne Bruce – Australia's PMs – Australia's Prime Ministers". National Archives of Australia. Archived from the original on 11 February 2014. Retrieved 23 April 2010. ^ Wigmore 1971, p. 101. ^ Wigmore 1971, pp. 125-128. ^ Gibbney 1988, pp. 116-126. ^ Fitzgerald 1987, p. 115. ^ Fitzgerald 1987, p. 128. ^ Wigmore 1971, p. 113. ^ Sparke 1988, p. 6. ^ a b Sparke 1988, pp. 1-3. ^ Sparke 1988, pp. 7-9. ^ Minty, A. E. (1973). "Lake Burley Griffin, Australia". In Ackermann, William C.; White, Gilbert F.; Worthington, E. B. Man-Made Lakes: Their Problems and Environmental Effects. American Geophysical Union. p. 804. ^ Sparke 1988, p. 30. ^ Sparke 1988, pp. 31-32. ^ a b Sparke 1988, pp. 103-104, 145, 188, 323. ^ Wigmore 1971, pp. 111-120. ^ Gibbney 1988, pp. 230-242. ^ Sparke 1988, pp. 130-140. ^ Sparke 1988, pp. 170-180. ^ a b c National Capital Development Commission 1988, p. 18. ^ Sparke 1988, pp. 173-174. ^ a b Fitzgerald 1987, p. 138. ^ Gibbney 1988, p. 250. ^ a b c Sparke 1988, p. 180. ^ Universal Publishers 2007, p. 6. ^ a b "Australian Parliament House – 10 Years On". Australian Broadcasting Corporation. 5 May 1998. Archived from the original on 18 April 2010. Retrieved 23 April 2010. ^ "Election timetable – 1989 Election". Elections ACT. Archived from the original on 28 March 2011. Retrieved 23 April 2010. ^ "Fact sheets". Legislative Assembly for the ACT. Archived from the original on 29 March 2013. Retrieved 23 April 2010. ^ a b "Role of the Assembly". Legislative Assembly for the ACT. Archived from the original on 27 May 2010. Retrieved 23 April 2010. ^ a b c d e "Past election results". Australian Broadcasting Corporation. Retrieved 31 January 2010. ^ Jerga, Josh (3 December 2009). "NSW boasts first female leadership team". The Sydney Morning Herald. Fairfax Media. Archived from the original on 15 May 2012. Retrieved 13 January 2010. ^ Doogan, Maria (December 2006). The Canberra Firestorm: Inquests and inquiry into four deaths and four fires between 8 and 18 January 2003 (PDF). 1. Canberra: ACT Coroners Court. Archived from the original (PDF) on 16 May 2009. Retrieved 7 June 2010. ^ "About the Centenary of Canberra". Centenary of Canberra unit – ACT Government. Archived from the original on 18 February 2013. Retrieved 8 February 2013. ^ "Sculpture as hot-air balloon - a whale of a commission". Media release. ACT Chief Minister and Cabinet Directorate. Retrieved 12 May 2013. ^ Maher, Louise. "StellrScope: Swirling art and science". 666 ABC Canberra. ABC. Retrieved 3 April 2017. ^ a b c d e f g h "Climate of Canberra Area". Bureau of Meteorology. Archived from the original on 12 July 2009. Retrieved 13 May 2010. ^ "Lady luck or lucky lady?". The Queanbeyan Age. 19 July 2002. Archived from the original on 3 March 2012. ^ "Canberra Nature Park: Mt Majura Nature Reserve" (PDF). ACT Government Territory and Municipal Services. 2004. Archived from the original (PDF) on 26 March 2012. Retrieved 13 May 2010. ^ "Canberra Nature Park: Mt Taylor Nature Reserve" (PDF). ACT Government Territory and Municipal Services. 2004. Archived from the original (PDF) on 1 May 2013. Retrieved 24 February 2013. ^ "Canberra Nature Park: Mt Ainslie Nature Reserve" (PDF). ACT Government Territory and Municipal Services. 2004. Archived from the original (PDF) on 1 May 2013. Retrieved 24 February 2013. ^ "Canberra Nature Park: Mt Mugga Mugga Nature Reserve" (PDF). ACT Government Territory and Municipal Services. 2004. Archived from the original (PDF) on 1 May 2013. Retrieved 24 February 2013. ^ "Canberra Nature Park: Black Mountain Nature Reserve" (PDF). ACT Government Territory and Municipal Services. 2004. Archived from the original (PDF) on 1 May 2013. Retrieved 24 February 2013. ^ a b Penguin Books Australia 2000, p. 28. ^ Sparke 1988, pp. 131-132. ^ Sparke 1988, pp. 181-182. ^ "Lake Ginninderra". ACT Government Territory and Municipal Services. Archived from the original on 28 June 2013. Retrieved 17 September 2013. ^ Williams 2006, p. 260. ^ Sparke 1988, pp. 4-7, 13-14. ^ Scrivener Dam (PDF). National Capital Authority. pp. 1–2. Archived from the original (PDF) on 1 May 2013. Retrieved 2 June 2009. ^ "Climate: Canberra – Climate graph, Temperature graph, Climate table". Climate-Data.org. Retrieved 5 September 2013. ^ "1301.0 – Year Book Australia, 2002". Australian Bureau of Statistics. 25 January 2002. Archived from the original on 12 October 2012. ^ "Canberra's warmest winter". abc.net.au. 31 August 2011. Retrieved 28 August 2016. ^ a b "Climate statistics for Australian locations: Canberra Airport Comparison". Bureau of Meteorology. Retrieved 3 September 2011. ^ "Australia – Climate of Our Continent". Bureau of Meteorology. Archived from the original on 17 March 2009. Retrieved 13 May 2010. ^ "Climate information for Canberra Aero". Bureau of Meteorology. Archived from the original on 4 June 2012. Retrieved 13 May 2010. ^ Wigmore 1971, pp. 60-63. ^ a b Wigmore 1971, p. 67. ^ Universal Publishers 2007, pp. 10-120. ^ National Capital Development Commission 1988, p. 3. ^ a b c d e Wigmore 1971, p. 64. ^ a b c d National Capital Development Commission 1988, p. 17. ^ Wigmore 1971, pp. 64-67. ^ "Timeline Entries for William Morris Hughes". National Archives of Australia. Retrieved 13 May 2010. ^ Universal Publishers 2007, pp. 10-60. ^ Gibbney 1988, pp. 110-200. ^ "About Weston Creek, Canberra". Weston Creek Community Council. Archived from the original on 8 April 2010. Retrieved 23 April 2010. ^ Fitzgerald 1987, p. 167. ^ a b c d e f "Lake Burley Griffin Interactive Map". National Capital Authority. Archived from the original on 22 May 2009. Retrieved 1 June 2009. ^ a b Sparke 1988, pp. 154-155. ^ "How to cut through the ACT's planning thicket". The Canberra Times. 2 March 2005. Archived from the original on 13 November 2011. Retrieved 13 May 2010. ^ a b Trail, Jim (9 April 2010). "It's time to review the grand plan for Canberra, says the NCA". Australian Broadcasting Corporation. Retrieved 13 May 2010. ^ "Grants of leases". ACT Planning & Land Authority. Archived from the original on 29 September 2009. Retrieved 13 May 2010. ^ a b "Place name processes". ACT Planning & Land Authority. 11 May 2009. Archived from the original on 19 April 2013. Retrieved 10 May 2010. ^ "Foreign Embassies in Australia". Department of Foreign Affairs and Trade. Archived from the original on 21 March 2015. Retrieved 23 March 2015. ^ Johnston, Dorothy (September 2000). "Cyberspace and Canberra Crime Fiction". Australian Humanities Review. Archived from the original on 7 January 2011. Retrieved 13 May 2010. ^ a b c "Environmental care". www.floriadeaustralia.com. Archived from the original on 26 February 2015. Retrieved 9 March 2015. ^ "Sustainability issues in Canberra – background". ACT Government. 13 June 2012. Archived from the original on 26 April 2013. ^ Corbell, Simon (28 August 2013). "Minister showcases Canberra's sustainability success" (Press release). ^ a b "ACT sets 90% renewable energy target in law" (Press release). ACT Government. 4 November 2013. Retrieved 25 February 2014. ^ Lawson, Kirsten (29 April 2016). "ACT commits to 100 per cent renewable energy target by 2020: Simon Corbell". The Canberra Times. Fairfax Media. Archived from the original on 28 May 2016. ^ "ACT to be powered by 100pc renewable energy by 2020". Australian Broadcasting Corporation. 29 April 2016. Archived from the original on 9 June 2016. ^ "Zero waste" (PDF). Residua. September 2001. Archived from the original (PDF) on 18 November 2011. ^ Lauer, Sandra (23 May 2007). "Reducing commercial waste going to landfill in Canberra by improving the waste management practices of micro businesses" (PDF). ACT Government. Archived from the original (PDF) on 19 May 2013. ^ "Canberra's waste dilemma". CityNews Canberra. 2 March 2011. Archived from the original on 5 May 2013. ^ a b Dyett, Kathleen (1 November 2011). "ACT bag ban begins". ABC News. Archived from the original on 12 January 2012. ^ "Bin bag sales booming". ABC News. 9 January 2012. Archived from the original on 12 January 2012. ^ Nash, Lucy (18 January 2010). "No waste 2010=some waste 2010". 666 ABC Canberra. Archived from the original on 11 January 2015. ^ Pryor, Penny (30 October 2011). "Saving money can help save others". The Canberra Times. Fairfax Media. Archived from the original on 4 June 2012. ^ a b "Role of the Assembly". Legislative Assembly for the ACT. 2010. Archived from the original on 27 May 2010. Retrieved 13 May 2010. ^ "Electorates 2016 election". Elections ACT. Retrieved 9 December 2016. ^ "Turbulent 20yrs of self-government". Australian Broadcasting Corporation. 11 May 2009. Retrieved 31 January 2010. ^ Antony Green. "2016 ACT Election Preview". Australian Broadcasting Corporation. Retrieved 9 December 2016. ^ a b "Administration of National Land". National Capital Authority. 18 December 2008. Retrieved 13 May 2010. ^ "Capital Works Overview". National Capital Authority. 23 October 2008. Retrieved 13 May 2010. ^ "Maintenance and Operation of Assets". National Capital Authority. 23 October 2008. Retrieved 13 May 2010. ^ a b Sparke 1988, p. 289. ^ a b "ACT Representation (House of Representatives) Act 1974 (Cth)". National Archives of Australia. Archived from the original on 16 December 2017. Retrieved 29 January 2010. ^ "Senate – A.C.T." Australian Broadcasting Corporation. 6 November 2007. Retrieved 31 January 2010. ^ "Frequently Asked Questions". Australian Federal Police. 19 November 2009. Archived from the original on 3 January 2010. Retrieved 21 January 2010. ^ "ACT Policing". Australian Federal Police. 16 March 2010. Archived from the original on 27 January 2010. Retrieved 23 April 2010. ^ "History of the Court of Appeal and the Supreme Court". The Supreme Court of the ACT. Archived from the original on 16 May 2016. Retrieved 7 March 2014. ^ Laverty, Jo (21 May 2009). "The Belconnen Remand Centre". Australian Broadcasting Corporation. Retrieved 23 April 2010. ^ Kittel, Nicholas (26 November 2008). "ACT prison built to meet human rights obligations". Australian Broadcasting Corporation. Archived from the original on 1 May 2013. Retrieved 23 April 2010. ^ "Canberra Court List". Family Court of Australia. Retrieved 13 May 2010. ^ "Court Listing". ACT Law Courts and Tribunals. Archived from the original on 2 May 2013. Retrieved 13 May 2010. ^ "4510.0 – Recorded Crime – Victims, Australia, 2016". Australian Bureau of Statistics. 6 July 2017. Retrieved 7 December 2017. ^ Australian Bureau of Statistics (27 June 2017). "Australian Capital Territory". 2016 Census QuickStats. Retrieved 7 December 2017. ^ Australian Bureau of Statistics (27 June 2017). "Australia". 2016 Census QuickStats. Retrieved 7 December 2017. ^ "1367.0 State and Territory Statistical Indicators – Unemplyment rate: ABS". Australian Bureau of Statistics. 12 June 2012. Retrieved 6 July 2012. ^ "ACT Stats, 2005". Australian Bureau of Statistics. 12 September 2005. Retrieved 13 May 2010. ^ "6302.0 – Average Weekly Earnings, Australia, May 2013". Australian Bureau of Statistics. 15 August 2013. Archived from the original on 21 October 2013. Retrieved 4 November 2013. ^ Janda, Michael (29 October 2009). "House prices surge as rate hike looms". Australian Broadcasting Corporation. Retrieved 13 May 2010. ^ "It's official: the property market has cooled". Real Estate Institute of Australia. 9 September 2010. Archived from the original on 19 July 2008. Retrieved 7 June 2010. ^ "Census of Population and Housing Australia in Profile A Regional Analysis". Australian Bureau of Statistics. 2004. Retrieved 13 May 2010. ^ Clisby, Meredith (16 January 2014). "ACT still expensive place to live despite fall in rent prices". The Canberra Times. Fairfax Media. Archived from the original on 8 March 2014. ^ "Gross State Product 2011–12" (PDF). ACT Government Chief Minister and Treasury Directorate, Economics Branch. 21 November 2012. Archived from the original (PDF) on 30 July 2013. Retrieved 17 September 2013. ^ "Industry of employment by place of work". ACT Government Chief Minister and Treasury Directorate. 28 June 2013. Archived from the original on 17 September 2013. Retrieved 17 September 2013. ^ "HMAS Harman". Royal Australian Navy. 2008. Retrieved 3 April 2013. ^ "Fairbairn: Australian War Memorial". Australian War Memorial. 2010. Retrieved 23 April 2010. ^ "RAAF Museum Fairbairn". RAAF Museum. 2009. Retrieved 13 May 2010. ^ "No 34 Squadron". RAAF Museum. 2009. Retrieved 13 May 2010. ^ Sutherland, Tracy (15 January 2007). "USFTA begins to reap results". Australian Financial Review. Archived from the original on 13 October 2009. Retrieved 17 June 2010. ^ Sharma, Mahesh (2 April 2008). "HP bids for Tower Software". The Australian. Retrieved 17 June 2010. ^ Colley, Andrew (2 October 2007). "HP bids for Tower Software". The Australian. Retrieved 17 June 2010. ^ a b c d e Australian Bureau of Statistics (27 June 2017). "Canberra - Queanbeyan (Canberra Part)". 2016 Census QuickStats. Retrieved 29 October 2017. ^ Australian Bureau of Statistics (31 October 2012). "Canberra - Queanbeyan (Canberra Part)". 2011 Census QuickStats. Retrieved 29 October 2017. ^ Australian Bureau of Statistics (25 October 2007). "Community Profile Series : Canberra - Queanbeyan (Canberra Part)". 2006 Census of Population and Housing. Retrieved 29 October 2017. ^ "Australian Demographic Statistics, Dec 2002". Australian Bureau of Statistics. 5 June 2003. Retrieved 7 June 2010. ^ "6227.0 – Education and Work, Australia, May 2017". Australian Bureau of Statistics. 6 November 2017. Retrieved 8 December 2017. ^ "Sweet charity: territory leads in giving". The Canberra Times. Fairfax Media. 4 November 2013. Archived from the original on 4 November 2013. ^ "University of Canberra". Department of Education, Employment and Workplace Relations. Archived from the original on 11 December 2011. Retrieved 23 April 2010. ^ a b "Australian National University". Department of Education, Employment and Workplace Relations. Archived from the original on 27 September 2011. Retrieved 23 April 2010. ^ Gibbney 1988, pp. 258-262. ^ "Academic Ranking of World Universities 2004" (PDF). Institute of Higher Education, Shanghai Jiao Tong University. 2004. Archived from the original (PDF) on 27 November 2007. Retrieved 13 May 2010. ^ "Canberra Campus". Australian Catholic University. 5 May 2010. Archived from the original on 27 January 2010. Retrieved 13 May 2010. ^ "Canberra School of Theology". Charles Sturt University. Archived from the original on 30 April 2010. Retrieved 23 April 2010. ^ "Australian Defence College". Australian Defence College. Archived from the original on 8 August 2013. Retrieved 23 April 2010. ^ "Campbell". North Canberra Community Council. Archived from the original on 23 April 2011. Retrieved 23 April 2010. ^ "The Program". Australian Defence Force Academy. Archived from the original on 27 August 2013. Retrieved 23 April 2010. ^ "Introduction". Australian Defence Force Academy. 2 April 2009. Archived from the original on 12 November 2009. Retrieved 23 April 2010. ^ "Officer Training". Defence Jobs. Retrieved 23 April 2010. ^ "Campus Maps". Canberra Institute of Technology. 25 February 2010. Archived from the original on 23 August 2010. Retrieved 23 April 2010. ^ "4221.0 - Schools, Australia, 2016". Australian Bureau of Statistics. 2 February 2017. Retrieved 4 March 2017. ^ Barr, Andrew (2007). "Towards 2020: Renewing Our Schools – Message from the Minister". ACT Department of Education and Training. Archived from the original on 2 March 2011. Retrieved 13 May 2005. ^ "Closing date for primary school". Australian Broadcasting Corporation. 29 October 2009. Retrieved 10 May 2010. ^ "Tharwa, Hall schools should be reopened: committee". Australian Broadcasting Corporation. 17 September 2009. Retrieved 13 May 2010. ^ "School closures report 'doesn't go far enough'". Australian Broadcasting Corporation. 18 September 2009. Archived from the original on 31 January 2010. Retrieved 13 May 2010. ^ Universal Publishers 2007, pp. 1-90. ^ Macdonald, Emma (8 May 2013). "Public schools win young, but lose seniors". The Canberra Times. Fairfax Media. Archived from the original on 28 February 2014. ^ Clarke, Jenna (9 July 2013). "Foreshore Festival axed for 2013". The Canberra Times. Fairfax Media. Archived from the original on 18 August 2013. ^ Fallon, Naomi; Scanlon, Joni (11 October 2012). "Stone rolls on". The Sydney Morning Herald. Fairfax Media. Archived from the original on 5 November 2015. ^ Vaisutis 2009, pp. 283-285. ^ Universal Publishers 2007, pp. 10-12. ^ "Festival celebrates Canberra-Nara friendship". Australian Broadcasting Corporation. 26 September 2008. Archived from the original on 29 September 2008. Retrieved 23 April 2010. ^ "Canberra Nara Park". ACT Government Territory and Municipal Services. 9 October 1999. Archived from the original on 17 September 2013. Retrieved 17 September 2013. ^ "Speaker archive". National Press Club of Australia. Archived from the original on 19 April 2010. Retrieved 13 May 2010. ^ "BMA comes of age". 666 ABC Canberra. Australian Broadcasting Corporation. 24 March 2013. Archived from the original on 7 October 2013. Retrieved 30 January 2017. ^ "Bills Digest No. 132 2001–02: Broadcasting Services Amendment (Media Ownership) Bill 2002". Parliament of Australia. 21 March 2002. Archived from the original on 31 January 2013. Retrieved 25 September 2013. ^ "Brumbies Crowned Super 12 Champions". Irish Rugby. 22 May 2004. Archived from the original on 13 October 2007. Retrieved 8 October 2007. ^ "Premiership Records". NRL. Archived from the original on 29 October 2015. Retrieved 19 November 2015. ^ "Canberra Stadium". Australian Institute of Sport. Archived from the original on 9 October 2007. Retrieved 9 March 2016. ^ "Sydney 2000:Football". Australian Broadcasting Corporation. 1999. Archived from the original on 3 August 2007. Retrieved 8 October 2007. ^ "Complete draw for 2003 Rugby World Cup". Australian Broadcasting Corporation. 2003. Retrieved 8 October 2007. ^ "Caps take WNBL championship". Australian Broadcasting Corporation. 17 February 2007. Retrieved 8 October 2007. ^ "Canberra downs Roar to clinch W-League title". Australian Broadcasting Corporation. 31 January 2012. Retrieved 3 February 2012. ^ Hinds, Richard (1 April 2005). "Kangaroos finding capital gains taxing". The Sydney Morning Herald. Retrieved 8 October 2007. ^ "Dogs, Demons to play in Canberra". Australian Broadcasting Corporation. 16 August 2006. Archived from the original on 13 October 2007. Retrieved 9 October 2007. ^ "Who Rules, Aussie Rules!". AFL. 15 February 2007. Archived from the original on 5 March 2007. Retrieved 8 October 2007. ^ Growden 2008, pp. 200-210. ^ "Canberra Marathon". Canberra Marathon. Archived from the original on 7 August 2011. Retrieved 8 October 2007. ^ a b Sparke 1988, p. 304. ^ "History and successes". Australian Institute of Sport. Archived from the original on 18 January 2013. Retrieved 8 October 2007. ^ "Boating on Lake Burley Griffin". National Capital Authority. Archived from the original on 23 September 2007. Retrieved 9 October 2007. ^ "Lake Burley Griffin reopens". ABC News. Australian Broadcasting Corporation. 16 November 2007. Retrieved 26 July 2010. ^ "Canberra Dragway Frequently Asked Questions" (PDF). ACT Government. 21 February 2006. Archived from the original (PDF) on 10 April 2012. Retrieved 8 October 2007. ^ "Possum Bourne". Australian Broadcasting Corporation. 3 May 2003. Archived from the original on 25 April 2013. Retrieved 8 October 2007. ^ "15 years since hospital implosion tragedy". The Canberra Times. Fairfax Media. 13 July 2012. Archived from the original on 14 July 2012. Retrieved 25 September 2013. ^ Reynolds, Fiona (5 November 1999). "Increasing pressure on ACT Chief Minister". A.M. Australian Broadcasting Corporation. Archived from the original on 4 November 2012. Retrieved 2 June 2009. ^ Penguin Books Australia 2000, pp. 23-25. ^ Penguin Books Australia 2000, pp. 3-6, 32-35, 53-59, 74-77, 90-91, 101-104. ^ Universal Publishers 2007, pp. 1-100. ^ a b Lawson, Kirsten (11 March 2014). "Impact of traffic cameras on speed put under microscope". The Canberra Times. Fairfax Media. Archived from the original on 11 March 2014. ^ Shellshear, Walter M. "Railways". Canberra's Engineering Heritage. Engineers Australia. Archived from the original on 23 July 2013. Retrieved 7 June 2010. ^ Richardson, Michael (19 July 2000). "Sydney to Canberra in 80 Minutes–by High-Speed Train". New York Times. Archived from the original on 1 May 2013. Retrieved 7 June 2010. ^ "Oz HSR Received?". The Australian. 29 October 2002. Archived from the original on 6 March 2012. Retrieved 7 June 2010. ^ Somer, Belinda (14 June 2001). "Govt considers rail link between eastern cities". Australian Broadcasting Corporation. Retrieved 7 June 2010. ^ AECOM; Booz and Co; KPMG; Hyder; Acil Tasman; Grimshaw Architects (April 2013). "High Speed Rail Study Phase 2 Report" (PDF). Australian Government Department of Infrastructure and Transport. Libraries Australia ID 50778307. Archived from the original (PDF) on 25 June 2013. ^ Gibbney 1988, pp. 58, 60. ^ Corbell, Simon (31 July 2013). "Canberra ranks highly in national report" (Press release). Archived from the original on 18 March 2014. ^ Thomson, Phillip (19 March 2014). "Costs add up as more cyclists take to public roads and suffer tumbles". Archived from the original on 19 March 2014. ^ Thistleton, John (25 June 2014). "Cycling campaign group Pedal Power slams ACT government on injury rates". The Canberra Times. Fairfax Media. Archived from the original on 25 June 2014. ^ "Large scale feed-in tariff law expanded to meet 90% renewables target" (Press release). ACT Government. 27 February 2014. Retrieved 7 March 2014. ^ "Wind auction result delivers renewable energy and economic benefits to the ACT" (Press release). ACT Government. 6 February 2015. Retrieved 10 March 2015. ^ "Hornsdale achieves new record price in ACT's second wind auction" (Press release). ACT Government. 21 December 2015. Retrieved 4 March 2016. ^ "New wind farm set to power more than just Canberra homes" (Press release). ACT Government. 4 March 2016. Retrieved 4 March 2016. ^ "Turning waste into energy" (Press release). ACT Government. 7 March 2014. Retrieved 11 March 2014. ^ "8146.0 - Household Use of Information Technology, Australia, 2014-15". Australian Bureau of Statistics. 18 February 2016. Retrieved 4 January 2017. ^ "Canberra adopts New Zealand capital as sister city". ABC News. Australian Broadcasting Corporation. 7 July 2016. Archived from the original on 10 July 2016. Australian Bureau of Statistics (25 January 1963). "The Australian Capital Territory, Canberra the National Capital: Fifty Years of Development". Year Book Australia. Australian Bureau of Statistics. Archived from the original on 4 June 2011. Leigh, Andrew (3 October 2010). Canberra is the Best City in Australia (Speech). Festival of Dangerous Ideas. Sydney Opera House. Archived from the original on 13 September 2013. Retrieved 13 September 2013. Walter Burley Griffin was an American architect and landscape architect. He is known for designing Canberra, Australia's capital city. He has been credited with the development of the L-shaped floor plan, the carport and an innovative use of reinforced concrete. Mount Ainslie is a hill with an elevation of 843 metres (2,766 ft) AHD that is located in the northeastern suburbs of Canberra, in the Australian Capital Territory, Australia. Mount Ainslie lies within part of the Canberra Nature Park. Lennox Gardens, a park in Canberra, Australia, lying on the south side of Lake Burley Griffin, close to Commonwealth Avenue Bridge and Albert Hall in the suburb of Yarralumla. Before the construction of Lake Burley Griffin a road ran through the present garden, this road being one of two main crossing points across the Molonglo River. The name of the road was Lennox Crossing from which the present garden takes its name. The northern segment of the road is still present on Acton peninsula. The garden was officially named in 1963. Lennox Crossing was named after David Lennox, an early bridge builder in NSW and Victoria. Aspen Island, within Lake Burley Griffin, is a man-made island located in Canberra, Australian Capital Territory, Australia. Scrivener Dam, a concrete gravity dam that impounds Molonglo River, is located in Canberra, Australian Capital Territory, Australia. The dam creates Lake Burley Griffin, that was established for recreational and ornamental purposes. Named in honour of surveyor, Charles Scrivener, the dam was officially inaugurated on 20 September 1964 and the official filling of the lake commemorated on 17 October 1964, by the Prime Minister, Robert Menzies. Elections to the Australian Capital Territory Legislative Assembly were held on Saturday, 18 October 2008. The incumbent Labor Party, led by Jon Stanhope, was challenged by the Liberal Party, led by Zed Seselja. Candidates were elected to fill three multi-member electorates using a single transferable vote method, known as the Hare-Clark system. The result was another hung parliament with Labor winning seven seats, the Liberals six seats and the Greens finishing with four seats, giving the Greens the balance of power in the 17-member unicameral Assembly. On 31 October 2008, after almost two weeks of deliberations, the Greens chose to support a Labor minority government. Consequently, Labor was re-elected to a third consecutive term of government in the ACT. Stanhope was elected Chief Minister at the first sitting of the seventh Assembly on 5 November 2008. The District of Canberra Central is one of the original eighteen districts of the Australian Capital Territory used in land administration. The district is subdivided into divisions (suburbs), sections and blocks. The district of Canberra Central lies entirely within the bounds of the city of Canberra, the capital city of Australia. 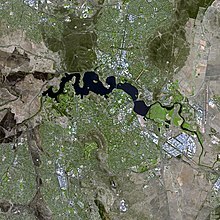 The history of Lake Burley Griffin, an artificial body of water in Canberra, the capital of Australia, is a long one. Following its initial design in the 1910s, extensive political disputes occurred until it was finally built in the 1960s. Sullivans Creek, a partly perennial stream of the Murrumbidgee catchment within the Murray-Darling basin, is located in Canberra, Australian Capital Territory, Australia. The Canberra light rail network is a light rail system to serve the city of Canberra, Australia. The initial 12-kilometre (7.5 mi) line links the northern town centre of Gungahlin to the city centre (Civic) and has 13 stops. Services are scheduled to commence on 20 April 2019. An extension of the line south to the Woden Town Centre is currently being planned. State Circle is a circular road surrounding Capital Hill in the centre of Canberra, Australia's capital city. It is the outermost of the three concentric roads on the hill, with Capital Circle and Parliament Drive located within State Circle. Capital Circle is a bi-directional four-lane road with most intersections being signalised and at-grade. The speed limit is 70 km/h.